Scooby-Doo! and WWE: Curse of the Speed Demon is a 2016 straight-to-video animated comedy mystery. It is the 27th animated movie in the Scooby-Doo straight-to-video series from Warner Bros. Animation. This series began in 1998 with Scooby-Doo on Zombie Island. 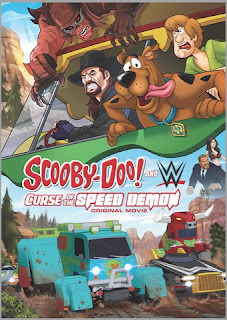 In Curse of the Speed Demon, Mystery Inc. is hired to solve the mystery of a phantom racer plaguing a WWE road race. This film is also a co-production between WWE Studios and Warner Bros. Animation. Meanwhile, WWE boss, Mr. McMahon, hires the rest of Mystery Inc. gang: Fred Jones (Frank Welker), Daphne Blake (Grey Griffin), and Velma Dinkley (Kate Micucci), to solve the mystery of Inferno. However, the young mystery-solvers suspect that Inferno is actually a WWE superstar! I have failed you, dear readers. I cannot explain why I like Scooby-Doo! and WWE: Curse of the Speed Demon. It is not a great movie, but I find quite entertaining. What are some of the things that I like. I am not a fan of WWE, but I found these cartoon versions of select WWE superstars likable, especially The Undertaker. The cartoon Stephanie McMahon seems personable. I found myself attracted to “Team Taker” and their racing vehicles. All the elements that make up monster/villain Inferno make him a good bad guy. Of course, when it comes down to it, I am a lifelong fan of Scooby-Doo and the rest of the Mystery Inc. gang. I don't really want to go to long without seeing them, and yes, I have come across some poor Scooby-Doo direct-to-DVD films. Scooby-Doo! and WWE: Curse of the Speed Demon is not one of them.